These giant dog breeds can be great pets just as much as their tiny canine brethren, and despite their sheer size (and the amount of food they’ll need), some of these breeds are surprisingly low maintenance. So, if you’re in the market for a larger dog, check out this list of the top 10 biggest dog breeds and see if one might be what you’re looking for. It’s a matter of debate, but the Great Dane is widely recognized as the largest breed of dog, at least regarding its height. A Great Dane named Zeus currently holds the Guinness World Record for tallest dog at 44 inches tall, and that’s when standing on all four legs! They will typically be around 30 to 36 inches tall, often a little taller. Great Danes are rather slender dogs and weigh between 100 and 120 pounds. Great Danes will grow into their full size very rapidly, reaching adult height within a year. Of German origin, the Great Dane is known as Deutsche Dogge in it’s native land, which means German Mastiff. The Great Dane that we know today is actually a crossbreed between English Mastiffs and Irish Wolfhounds. They were originally bred as hunting dogs, but now make great domestic pets, and are surprisingly thought of as great city and apartment dogs. Despite their huge size, Great Danes are very gentle and affectionate dogs. They love getting attention from their family members and strangers alike and actually have been used as therapy dogs. They are great companions who make great watchdogs due to their sensitive nature and size. Depending who you ask, many consider the Irish Wolfhound to be even taller than the Great Dane, and the tallest of all dog breeds. Originally bred as a war dog, fighting alongside ancient Celtic warriors, the Irish Wolfhound’s name comes from its former usage as a wolf hunter. This dog breed generally stands 28 to 35 inches tall and is typically heavier than the Great Dane, weighing in excess of 115 pounds, up to as high as 180. This powerful breed has a long, loping stride and a wide, powerful chest. Unlike the Great Dane, the Irish Wolfhound matures quite slowly, and won’t reach its full size until it is about two years old or more. They are very intelligent and will remain devoted to their family. They don’t bark and are not aggressive, but their size alone can make them good guard dogs. Although docile in nature, they will still require daily exercise to be happy and are best suited for an active family. With that said, they can be good dogs for city life, as long as they can get out for exercise. Although not the tallest dogs, in terms of sheer size, the English Mastiff may be considered the biggest dog. An English Mastiff named Zorba holds the Guinness Book of World Records record for the heaviest dog in the world, weighing in at a whopping 315 pounds. Considering mass, many consider the English Mastiff to be the largest dog breed in the world. Known for their huge heads and large bodies, English Mastiffs are actually a gentle and sweet breed of dog. They typically come in at 27 to 32 inches tall and will weigh between 150 and 250 pounds. Despite their gentle nature today, in ancient times they were used by the Romans in gladiatorial fights and are depicted on Egyptian monuments from as far back as 3,000 B.C. English Mastiffs are highly intelligent and rather lethargic dogs, only requiring daily walks. They sense threats well and coupled with their size, this makes them great guard dogs, despite the fact that they rarely ever bark. They make great family pets, but their sheer size must be kept in mind around small children. Saint Bernard’s originate from the Swiss Alps and were bred as rescue dogs by the monks in the Saint Bernard Hospice. These girthy and furry dogs stand between 25 and 30 inches and will weigh anywhere between 140 to 180 pounds. Along with their massive girth, Saint Bernards also come with superior strength and an impressive sense of smell, which was handy in their former career as rescue dogs. However, today’s Saint Bernards are generally family dogs, and well known for being gentle, loving and friendly pets that are great with children. This large breed must be trained and socialized, otherwise they can be quite destructive. Well-trained Saint Bernard’s will show great patience and be wonderful pets. They are very loyal to their families and can be quiet indoor dogs. Although great with children, they are not all that playful. Daily walking is required to keep them from gaining too much weight. The second Mastiff on our list, the Neapolitan Mastiff originates in Southern Italy and was once bred as a war dog by the ancient Romans. Like their English cousins, these dogs are amongst the largest in the world in terms of sheer mass. These massive dogs stand at 26 to 31 inches and will weigh between 110 and 155 pounds, with females typically being smaller than males. Due to their size and nature, Neapolitan Mastiffs are ideal watch dogs — fearless and protective of their home and family. However, they don’t bark at threats, and actually tend to sneak up on intruders rather than giving their owners a warning. Their protective nature makes them better suited for people well-versed in training dogs, particularly those that are more dominant owners. They will take time and patience to socialize, but are intelligent, and with time can make great pets. Named after the city in Germany from which they originate, these giant black dogs almost look like lions with their long coats. These muscular dogs are extremely powerful, and tip the scales at up to 170 pounds, but typically between 120 and 150. They stand at 27 to 31 inches tall. Their long coats are water-resistant and come in a variety of colors. Despite their massive size, these dogs are quite gentle and make great family dogs. While their loyalty and intelligence are unquestioned, they do require early socialization and training. Well-trained Leonbergers have great patience and are well-suited for children, but if not, they can be hard to manage. Leonbergers, when trained, will remain calm or walk away when children play with them too roughly. Great family pets, Leonbergers will be good at any activity they are given that requires strength and smarts. They can do anything from tracking and herding to water rescue, but mainly serve as great family companions. They are best suited for active families. The Newfoundland is related to the Leonberger, as the Leonberger is the result of generations of crossbreeding between the Newfoundland and Saint Bernard. These working dogs were originally bred to help fisherman haul in their nets and lines on the boat, pull carts and fetch anything that falls overboard, including people. Great water dogs and exceptional swimmers, they have been credited with many rescues. They stand between 27 and 30 inches and can weigh up to 150 pounds. They actually appear even bigger than that because of their thick, typically black double coat, which keeps them warm in cold waters. With their strong bones and build, Newfoundlands are actually thought to be stronger than even larger than breeds such as the English Mastiff. Newfoundlands rarely bark, but are protective of and devoted to their families. They are very social and intelligent, and can be trained easily, as they are very sensitive to their owner’s voice. They are very calm and friendly, making them well-suited for children, but should be closely monitored simply because of their size. With proper training, Newfoundlands will make great family pets that can also perform tasks that require great strength, and are happy to do so. A large and powerful dog breed native to Turkey, the Anatolian Shepherd was originally bred to protect livestock. These dogs weigh up to 150 pounds, and are known for their agility and endurance. With large, round heads and thick, powerful necks, Anatolian Shepherds have the look of the athletic animals that they are. Their big ears alone can be four to six inches in length, and naturally hang down. Anatolian Shepherds are affectionate, smart and loyal dogs, but can be very protective of their families and are suspicious of strangers. They will bark loudly if they need to confront an intruder. They will require training and need more than just a walk to be happy. This breed is best suited for active families who want a companion for their adventures. Anatolian Shepherds are great with children and love to play, but should be supervised because of how large and powerful they are. With proper training, routine activity, and a loving home, these dogs will make great family pets. Great Pyrenees are known for their protective nature and long-standing reputation as watch dogs. These large, beautiful dogs have an average height of 30 to 39 inches and weigh between 115 and 130 pounds. With their broad chests and long weather-resistant double coat, typically in white, these dogs appear much larger than their actual weight. Great Pyrenees have a keen sense of hearing and detect intruders and other animals quite easily. They bark often, which can be reduced with training. Training should begin while they are very young puppies, as they can become very aggressive if not given proper training early. Great Pyrenees need space to roam and are not good apartment dogs. They are very devoted to their family, and with proper training, Great Pyrenees can be sweet, affectionate pets. They love to play with children and other family pets and do best with constant activity. 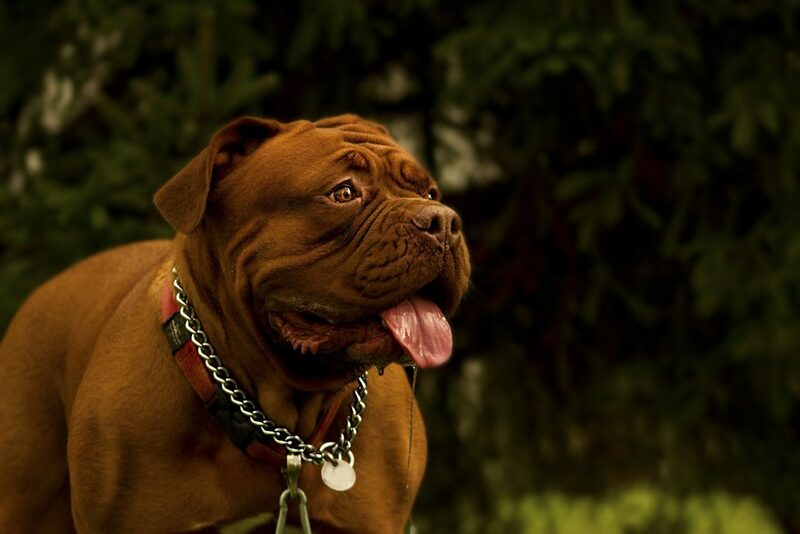 The third and final Mastiff on our list, the French Mastiff breed is also known as Dogue de Bordeaux. They are distinguishable by their huge heads and muscular bodies. They are considered the most attractive of the Mastiffs because of their thick skin and significant wrinkles on their face and neck. Adult French Mastiffs will stand between 20 and 23 inches and weigh around 135 pounds. French Mastiffs are very loyal and protective of their family. They are extremely devoted to their families and love to be around them. They are gentle with children and will get along with other pets in the family. They must be trained early as puppies and should be socialized early on as well. They can be raised to be good watchdogs and can even be trained to be effective rescue dogs. With proper training, a French Mastiff will make a great addition to any family.